In Salesforce, you have four “Personal” folders. These Salesforce Personal Folders are accessible by you only. If you save an item to your Salesforce Personal Folder, it cannot be seen by anyone, including Salesforce system administrators. 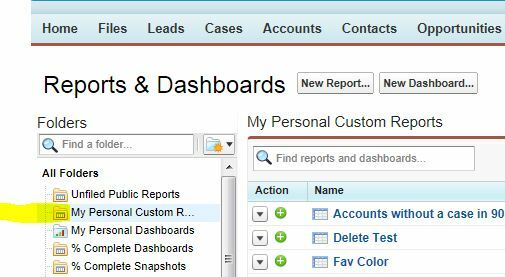 The four Salesforce Personal Folders are: “My Personal Reports”, “My Personal Dashboards”, “My Personal Email Templates”, and “My Personal Documents”. 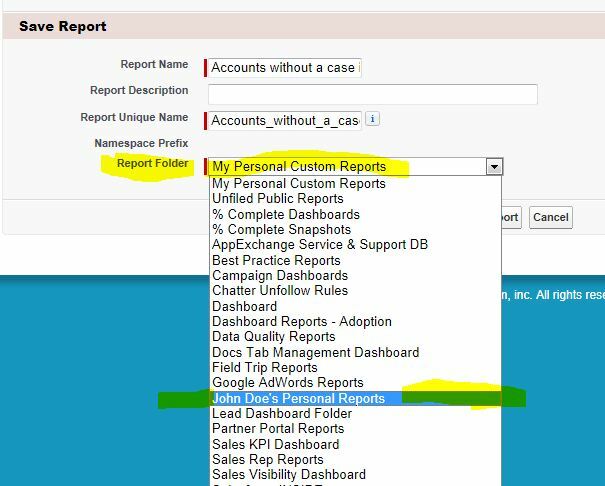 In the these posts we describe the steps (with screen shots) to check if you have anything in these Salesforce Personal Folders and how to make them public. If you decide to make them public, you will need to let your Salesforce system administrator know what type of item (Report, Template, Document, etc.) you want to make public. If you have any reports in here, you are the only one that can access them. Your Salesforce system administrator does not even know that they exist. If you want to make them public, let your admin know and they can create a public folder for you (steps below in the admin section). Once that folder is created, you will need to run each report and use the “Save” button (picture below). In the “Save” dialogue, use the “Report Folder” drop-down list to select the folder with your name (picture below for “John Doe”). Then save the report. That’s it. Your report is now visible to anyone who has access to that folder (access is set by your administrator). Repeat these steps for any other reports you would like to share. The steps for your personal dashboards are the same as the above for your reports except you use the “My Personal Dashboards” folder (picture below) instead of your personal reports folder. Viewing and saving remains the same. It is unlikely that you will have dashboards in here but to be thorough, it should be included. StarrForce is a Salesforce Partner that helps companies deploy, simplify and support Salesforce.com. If you would like information on the services we offer call us at (888) 391-4493 Ext. 101.